Basketball is one of the most widely played games in the United States, perhaps only matched by tennis or baseball. Basketball is accessible year-round because it is played on a relatively small space, and there are indoor facilities around the country (and the world) where men, women, boys and girls of every age can shoot some hoops. This has created a popular demand for basketballs and basketball-related products. Few driveways in America are without a basketball hoop. Those that don't have hoops often have portable hoops nearby, thanks to the development of adequate counter-weight technology. Some people even enjoy playing a little basketball while they take a dip in the pool, and floating nets are a terrific gift idea for any pool-owning basketball lover. Many people may not think so, but the truth is that a good pair of well-cushioned sneakers is integral for playing a great game of basketball. This is particularly true if you are playing on a hardwood court. Good sneakers with great soles give you the traction you need to make quick movements and fool your defender. Whether you're in the market for a decent basketball, a backboard for your home, or some dependable sneakers for the court, there are a wide range of online sporting goods stores and sports equipment retailers who offer all the basketball gear you need. 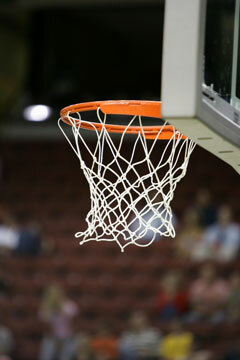 This sporting goods store chain offers a broad selection of basketballs, backboard systems, footwear, and accessories. This chain of sporting goods stores features a good selection of basketballs, backboard systems and accessories, apparel and footwear. This manufacturer of sports equipment focuses on making technologically advanced basketball products which help the average player play better. Offers a full lineup of basketball systems for all skill levels. Find in-ground and portable systems plus basketball poles, backboards, rims, bases and accessories. Offers rugged, long lasting basketball goals for indoor gymnasiums and outdoor playgrounds.